Japan Karatedo Federation, Size: 18 x 26 cm. 213 pages- English/Japanese. Japan Karatedo Federation, Size: 18 x 26 cm. 213 pages- English/Japanese. Teaching book for 8 Shitei Kata according to WKF rules 2001. Goju: Seipai - Saipha, Shoto: Jion - KankuDai, Shito: Seienchin - BassaiDai, Wado: Seishan - Chinto. Clear fotos step by step for all official Shitei Kata. 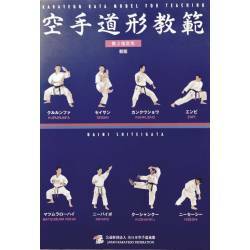 From all angles of view, with clear instructions and examples of Kata Bunkai.